Dubai, UAE, September 22, 2016: Have just 48 hours to get the most out of London and the surrounding region? Don’t fear, we’re here to help. From the best tea shops and art-deco hotels London has to offer to the perfect spots for enjoying some of the best countryside scenery in the whole of England, our guide will ensure that you don’t miss out. Within easy reach of London, Oxford offers a family friendly mix of activities, relaxation and retail therapy when the hustle and bustle of the capital of England get to be too much. We took it upon ourselves to conduct in-depth research to discover what is worth doing and what isn’t. And based on those very findings, we crafted the definitive guide to getting the most out of London and Oxford in just two days. Here are our recommendations broken down in three categories. The Wellesley Hotel (London): Opulent, elegant and contemporary, The Wellesley of Knightsbridge is the perfect choice for a decadent night in the city. Situated within an immaculate 1920’s townhouse, the hotel truly embodies the glamour of the era with its marble flooring and art deco interior. Visit the Jazz Lounge on Friday and Saturday nights for spectacular live music or head down to the Oval restaurant for the finest Italian food, artfully created by Head chef Michele del Monaco. Old Swan & Minster Mill (Oxford): Blink and you’ll miss it, this quintessential hidden gem is located in the beautiful Cotswold thatched village of Minster Lovell, set among the wild flower meadows. Toast by the log fire or away the afternoon with a tranquil countryside walk or soothing Yon- Ka Spa treatment, your options are endless at this homespun countryside hideaway. Le Kalon Spa at The Bentley Hotel: Escape from the hustle and bustle of the city at The Bentley Hotel’s Le Kalon Spa. An oasis of calm and rejuvenation, the soothing interior will have you feeling instantly relaxed on arrival. In addition to a range of beautifying treatments, the spa is also home to London’s only authentic hammam. Adopting the traditions of ancient cleansing rituals, guests can unwind in a warm steam filled room before enjoying a massage - the perfect antidote to a busy London day. 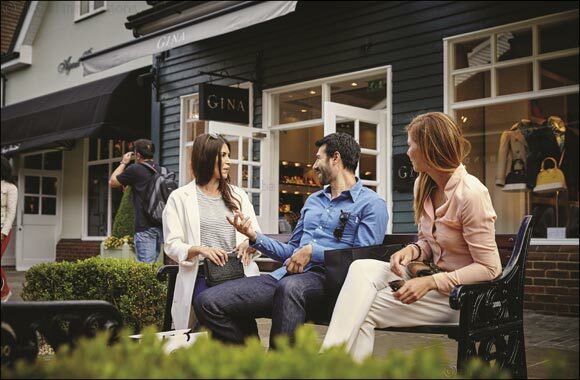 Bicester Village (Oxford, just 46 minutes by train from London Marylebone station): Or for a bit of retail therapy, Bicester Village boasts over 130 boutiques with savings of up to 60%, and sometimes more, off the recommended retail price. Dedicated to creating a luxury experience, the Village reflects the look and feel of local villages nearby, with whitewashed boutiques and beautifully landscaped streets. To make your visit extra special, this elegant destination also offers a range of five-star services including Hands Free Shopping, Valet Parking and a range of authentic dining options. With gorgeous pieces from brands such as Marni, Oscar De La Renta, Temperley and Rupert Sanderson, this is shopping at its best. This summer Bicester Village also welcomed its first multi-brand premium watch and jewellery offering, L’Atelier. Warwick Castle: For a bit of culture, visit Warwick Castle. This expansive medieval castle is surrounded by the beautiful river which runs straight into the charming town of Royal Lemington Spa. Take an afternoon to explore to your hearts content and casually stroll into town to uncover Lemington’s local hideaways. Coya (London): Bringing the spirit of Latin America to Piccadilly, Peruvian restaurant Coya is an incredible dining experience that’s not to be missed. Located next to Hyde Park, the mysterious lighting and interior creates an electric atmosphere, and the menu fuses traditional Peruvian cooking with contemporary cuisine for an incredible taste sensation. The White Rabbit Pub (Oxford): The White Rabbit is a hidden gem within Oxford City Centre, famed as a haven of ‘real ale’ and ‘proper conversation.’ This little hideaway prides itself for its traditional stance on the typical British Pub, with the ultimate twist of serving up arguably the best pizza in the city. Transport yourself to Italian land with a thin and crispy offering, stone baked to perfect by Milano Chef Matteo Ferrari. Don’t miss out on a city break or country escape, or both!